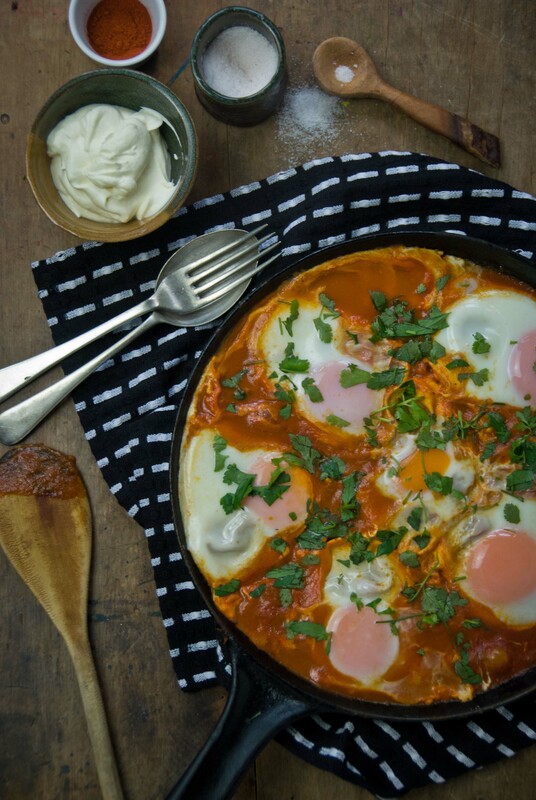 Shakshuka is a staple dish originating from Tunisia (northern-most country of Africa). 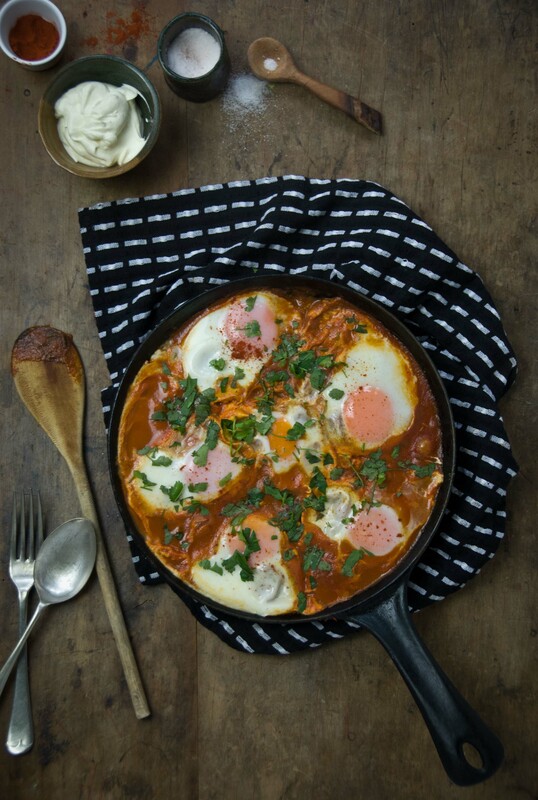 The basic dish consists primarily of eggs poached in a tomato base that is flavoured with garlic, chili, and spices. This dish can be made for breakfast, brunch, lunch or dinner and it can be adapted in many ways depending on what you have available at the time. Traditionally it is eaten with bread but I also love it served with beans, polenta or rice and a good dollop of sour cream. This is a quick and nourishing meal that is great for those on a budget. Feel free to play around and add whatever you fancy to the tomato base before adding the eggs. Some of my favourite things include cooked lentils, beans or chick peas and fresh spinach, kale or silver beet (chard). You can also play around with the seasonings and find your favourite combination. If you don’t eat eggs, you can replace them with 1-2cm thick pieces of pre-cooked polenta and add some cooked lentils or beans to form a complete protein. Equally as delicious! *for vegan option, replace eggs with pieces of pre-cooked vegan polenta and add beans or lentils to tomato base to form a complete protein. **for a dairy free sour cream option I love the tangy cashew cream by Homegrown Kitchen. Over a medium heat, heat oil or butter in a medium to large frying pan. Sauté onions for a few minutes until transparent and soft. Add any leafy greens now if using and let them wilt for a minute before step 2. Add garlic, cumin, smoked paprika, tomatoes, preserved lemon and salt and pepper to taste (add beans or lentils at this stage too if using). Simmer for 8-10 minutes. Crack eggs over the tomato base (or carefully place your polenta pieces on top of the tomato base) and cover with a lid (or a baking pan if you haven’t got a lid). Allow the eggs to cook until desired doneness. I like my egg yolks runny, so I only cook for about 4-5 minutes. Check to make sure the egg whites are cooked by removing the lid and jiggling the pan a little. The whites will wobble if uncooked. Serve with crusty bread and chopped fresh coriander and parsley and sour cream (or tangy cashew cream). Parmesan is also a nice addition too, if you fancy it. Delicious! Had it for dinner tonight and loved it.